You know how tired you are at the end of the day, now plug in your husband who doesn’t do this all time and it’s going to be good if he’s still standing. So, in an effort to have a sane husband when I return home I’ve tried to make his life as easy as I can meal wise. I’ve pre-cooked any meats he’ll need and have numerous meals in the freezer. All he has to do is remember to pull them out (maybe I’ll send a few text messages too). We have so many great veggies from produce co-op this weekend, so this is a throw it all in the pot meal and add some diced chicken. Here’s a great recipe that is very similar to how I make it. While I normally don’t love soup in the summer, I decided on this so we left them with a big amount of left overs for easy lunches. This is the one night where he’ll do a tad bit of cooking. I’ve already browned the hamburger (we always keep cooked ground beef and cooked shredded chicken in the freezer), so he just needs to cut up a tomato, and get out the toppings. Most of the girls prefer nachos since tacos are messy and stressful for little hands. This is already in the freezer, but the recipe we use is Paula Dean’s version. It adds mushrooms and almonds. Before you turn up your nose, I don’t like mushrooms at all, but it really does bring so much more flavors to this dish. We also sometimes add the rice straight to it before baking. Another freezer meal for them, this is a simple meal to through together and to make extras every time for the freezer. You’ll find recipes that have you in the kitchen for hours… please don’t do that. This can be something that is in the oven in less than 10 minutes, so only stress out on it if that is your thing. Here’s a recipe that shows just how simple you can make it. We don’t make the crust but just buy pie crusts. Normally this is make your pizza night, but this week I have a few DiGiorno pizzas in the freezer. Once we makes it to Friday he deserves a easy DiGiorno night! (There is a great deal this week at Walgreens to get them for $2.50 each). 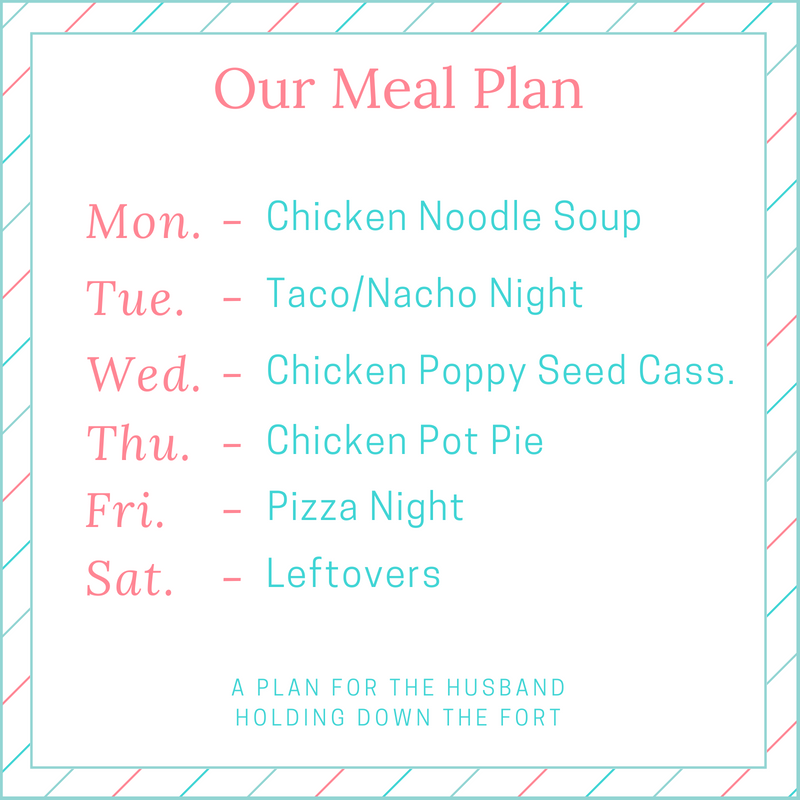 With so many casseroles and a big pot of soup I can only imagine how packed the fridge will be. They will eat on it for lunches, but I have no doubt there will be plenty to do a left over night. I also know that cooking the night I get home will be last thing I want to do. I should say, that I have a great husband who does help with cooking on a regular basis. I just prefer to make the week as easy as I can on him.